A Gilligan Builders designs and erects custom built extensions to suit Irish homes. When you decide to extend your home, get in contact with A Gilligan Builders, we can advise you on the right type of extension for your property. Whether you require extra living space for that growing family, extra storage space, or an extended kitchen, our pre build team can help you with all necessary paperwork and planning permission applications. Factors like site space can have an effect and even infringe on modern planning laws. Therefore, before you make your decision on an extension we advise you to gather as much information as possible. Our team can help advise you on the options you have available. For a free quote on your next home extension, get in contact with A Gilligan Builders today. Our commitment to delivering the most streamlined and smooth extension services means our team works closely with your architect to deliver the exact extension you want. Our professional team work with absolute efficacy thanks to our experience in allocating resources and manpower. 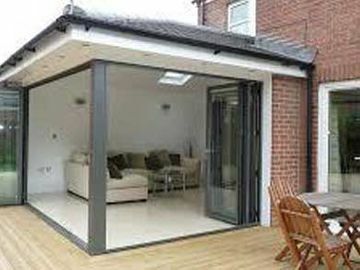 We deliver a modern extension built to the very highest of professional standards. To have us build your next home extension, get in contact with A Gilligan Builders today.